On a hot day, Uncle Matt’s own nieces and nephews love nothing more than a glass of refreshing lemonade. So we’ve created our own delicious blend of lemonade for you to savor. Our lemonade is made from freshly squeezed organic lemons picked at the height of the season and grown without the use of synthetic pesticides, herbicides or fertilizers. It’s the perfect balance of tart and sweet, so you can enjoy the fresh-squeezed taste of Uncle Matt’s homestyle lemonade anytime. So go ahead and enjoy the taste of summer. Brought to you by a family as committed to uncompromised organic nutrition as you are. 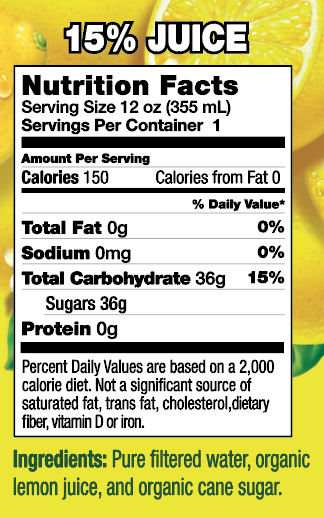 Uncle Matt’s lemonade uses only organic ingredients and is offered in family-friendly 59 oz size. As with all Uncle Matt’s products, no synthetic pesticides, herbicides or fertilizers are ever used in the growing process.